What Is an Annual Tear? An annular tear is a tear in somewhere in the annulus fibrosus. This is a ligament that makes up the capsule of the disc that’s found between the vertebrae. These discs act as cushions between the vertebrae, which are bony, and allow the spine to move and to absorb shocks. The discs are made up not only of the annulus fibrosus, but the nucleus polposus, which is inside the disc. The inner annulus and the nucleus have no nerves and so can’t feel pain, but the outside of the annulus does have nerves and the person may feel pain if it’s injured. However, sometimes an annular tear doesn't produce pain. If the annular tear produces pain, it will be because the substance in the nucleus polposus has leaked out and come into contact with the nerves. This causes the body to react through an inflammatory response. The disc might also have ruptured or might be bulging between the vertebrae. This will cause a sharp pain in the back, and numbness, tingling and weakness felt in a leg or the legs. Any sudden movement, including sneezing or coughing, can make the pain worse. The pain is eased when the person stands up and is still. Annular tears can be caused by the normal wear and tear of aging. The tear can begin as a small hole that doesn’t cause problems, but it may enlarge. If it enlarges, the gel-like substance of the nucleus can begin to leak out. Sports, especially contact sports like football, can also lead to annular tears. Annular tears can also be caused by very strenuous exercise, especially that which requires lifting heavy objects or bending. Being overweight and obese can put stress on the spine and lead to an annual tear as well. The tear can be diagnosed by a doctor using an X ray or a CT scan. The doctor can also inject a dye into the nucleus, which will show the extent of the damage. An annular tear can be rated from zero, which means that the disc is normal, to 6, which means that the tear is large enough for the nucleus to leak. Sometimes an annular tear will heal spontaneously, and create scar tissue that, to an extent, keeps the nucleus from leaking. Sometimes the patient can apply a cold therapy pad or compress to the area. These can be applied several times a day in 15 minute sessions. After that, replace cold with a thermal wrap or compresses can be applied to the injured area. The patient can also take NSAIDs like ibuprofen to ease the pain. Unlike a lot of back problems, an annular tear isn’t helped much by resting in bed. 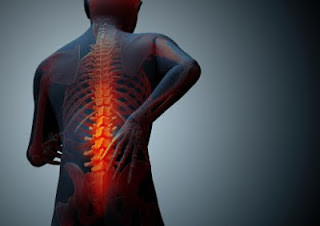 Long periods of time in bed can only weaken the back muscles.